Imhotep’s Dshawn Seals (right) run up field as Gratz’s Randy Johnson left defends during the first half of a a high school football on Friday. Every king needs a crown. Better yet, players on the defensive unit of Imhotep — the undisputed ruler of the Public League — take turns wearing a belt. Last season it was a pro-wrestling-styled championship belt. This year, the Panthers customized the belt, which now reads "Imhotep Football Turnover Champion." Friday night at the Germantown Supersite, plenty of paws handled the hardware as the Panthers mauled visiting Simon Gratz, 34-6. "Coming out, we had to show a standard for the city and show them we're still on top," said senior defensive terror Zymir Cobbs. "We came out with a mindset that we had to dominate." Cobbs, a senior captain, was disruptive all night, twice sacking the quarterback and forcing a fumble. In all, Imhotep (2-2, 1-0 Public) forced four turnovers in the decisive first half, earning a 20-0 edge after the first quarter that swelled to 28-0 by intermission. "The turnover belt pushes you and motivates you to get it, because everybody wants it," he said. "When you get it, it's like, 'I'm on top. I got the belt!' So everybody looks forward to getting it." Sophomore cornerback Shafeek Smith was first to snag the belt after his first-quarter interception stopped Gratz at the 1-yard line. Two plays later, West Virginia commit Tykee Smith exploded down the right sideline in a 95-yard track meet that was over after about 35 yards and gave Imhotep a 14-0 edge. Next, senior outside linebacker Tahmir Johnson added a strip-sack fumble that was scooped by sophomore safety Saint McLeod, who scored from about 51 yards out. Friendly banter about who was the rightful wearer of the belt ensued. "It's just extra incentive for us to create turnovers," said Devon Johnson, now in his second season as the Panthers' defensive coordinator. "It's just something to get them hyped and you see today they had four turnovers." Gratz (0-4, 0-1) managed a late touchdown. Several players showed fight throughout, but the young Bulldogs lacked experience. Rodneil Passapera finished with 221 yards passing but was on the run all night from Cobbs and Co. Juwaan Anderson (3 catches, 55 yards) and Jordan Mariney (4 for 93 yards) led the Gratz offense. 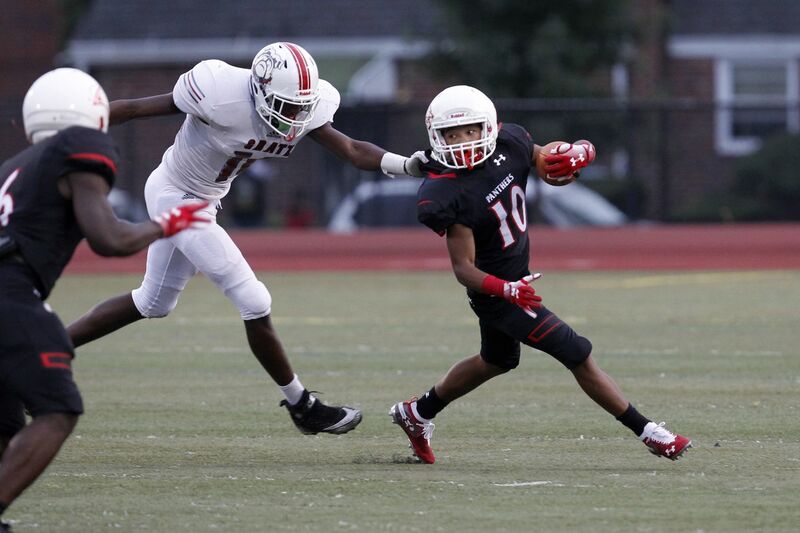 Imhotep was led by Tykee Smith's two rushing touchdowns and 113 yards on six carries. Quarterback Jalen Sutton-Christian added an early rushing touchdown and 5-of-6 passing for 73 yards. The Panthers' defense, however, was the key to the victory. Last year, stickers with a player's number would be placed on the belt for each forced turnovers. This year, however, a new belt purchased on Amazon by linebackers coach Damon Linder is given to a defender immediately after he creates a turnover upon his return to the sideline where a ball boy or teammate presents him with the belt. Cobbs has lived the life of a champion, belt or no belt. The senior started playing football at 10 years old. He grew up in the foster-care system and despite the instability in his life, he found football was his compass. "I didn't want to be in the streets so I just looked to football," he said. "Ever since then, it's been my backbone. It's gotten me through hard times."